In yet another testament to how quickly Scandal moves, the series finale is only an hour long. That’s right: There’s just one hour left of Scandal, a single 45-minute installment of television to wrap up what feels like at least a thousand dangling plot threads. 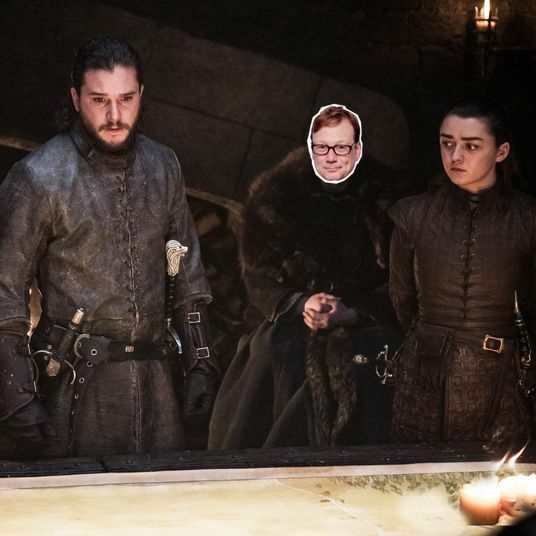 As if to allay any fears about the show’s ability to resolve all the problems it’s created, “Standing in the Sun” sprints through 30 episodes of plot in a single, jam-packed installment. Like most other episodes from the farewell season, “Sun” is more heat than light, but it manages the impressive feat of paying reference to the wackiest Scandal story lines and weaving them in a semi-cohesive narrative. The episode begins as President Mellie is preparing to sit for an interview with Special Prosecutor Lonnie Mencken to address the allegations against her, a potentially career-ending probe that implicates all the people she’s closest to. 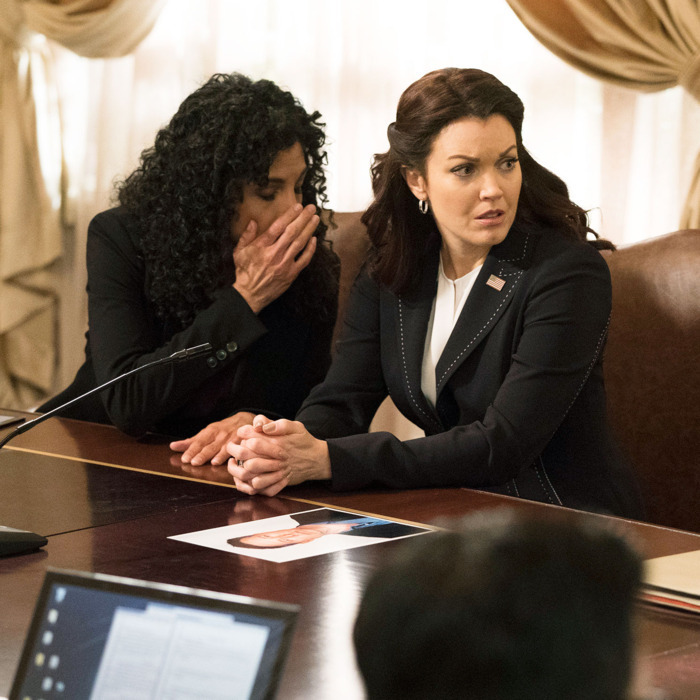 Despite the advice of her attorney, who comes out strongly in favor of pleading the Fifth, Mellie decides to go into the interrogation with what Olivia says is the most powerful weapon at her disposal: the truth. Yes, Charlie worked for Mellie in conjunction with his work for OPA, but no, Mellie didn’t hire Charlie to bring down the vice-president’s plane. That should be pretty obvious on its face, since Mellie has no apparent motivation to kill her own second-in-command. Or does she? The biggest bombshell dropped in the first of several tense boardroom face-offs with Special Prosecutor Mencken is his theory that Mellie was the driving force behind the assassination of President Rashad. According to Mencken, who has damning video evidence of an Oval Office conversation between Mellie and then-chief of staff Olivia, Mellie ordered Rashad’s tarmac explosion. When Cyrus found out the truth, the theory goes, Mellie conspired with Liv to take down his plane and hired Charlie to do it. After putting on a brave face and leading with the truth, Mellie scurries behind her Constitutional freedom from self-incrimination when Mencken’s line of questioning gets too uncomfortable. To twist the knife, Mencken delivers a subpoena and vows to ask Olivia the same tough questions asked of Mellie. It was one thing for Mellie to rely on the Fifth Amendment, but if Olivia does the same thing, the greater the public perception that the White House has something nefarious to hide. So instead of hiding the truth, Olivia embraces it in the most shocking way possible. She readily admits to Mencken that Mellie didn’t order the hit on President Rashad, and she can say that with confidence because she acted on her own. Not on the authority of the president, but on her own authority as Command, head of the shadow government known as B613. It’s quite the mic drop considering how badly Mencken has misjudged the situation. He’s essentially questioning his former boss, having no idea how much deadly influence Olivia once wielded. But a larger confrontation comes when Olivia urges everyone else in the White House to come clean about their knowledge of B613. The final season has been all about Olivia’s redemption as well as a return to the basics of the character: Olivia Pope, much like Judy Smith, the real-life fixer that inspired the character, has always said that telling the truth is more likely to get you out of trouble than into it. So what looks to everyone in her orbit like temporary insanity on Liv’s part is really just a return to form. By this time, though, everyone in Olivia’s orbit has gotten used to lying, especially about B613. There’s no way to expose B613 without implicating every regular character on the show, several of whom have killed on behalf of the organization multiple times. But that’s a risk they’ll have to take, Olivia tells the White House faction. She’s hoping to leave the QPA faction out of the line of fire, but Quinn, Abby, and Huck pledge their loyalty and offer to testify to Mencken about the existence of B613 no matter the cost. Olivia is hesitant to put her friends in any more danger, but she relents and allows them to sail over a cliff with her one last time. Their final plan requires them to expose the truth of B613 to the entire country, so Quinn convinces Sally Langston to do a segment on The Liberty Report designed to influence Mencken to investigate the real enemies of the state. And in the last ever Scandal cliffhanger, the gang’s cell phones all go berserk once the word on B613 is out. Does any of this story track? Not really, but between the deep dive into long-forgotten plotlines and the wistful overview of Olivia as a character, the episode has a sense of cohesion that defies the lack of logic. Scandal has been a wild ride, and it’s easier to forgive these final insane loop the loops when the station is just over the next rise.